Lately I have been absolutely obsessed by planners. Not necessarily using them, my summer doesn't have enough events or routine to be using one right not, but during the school year, my planner might as well be another hand. Between assignments, sorority events, group projects and whatever else is going on, I would be lost without my planner. I've used one for years, but more recently been entranced by the variety of planners. In high school I used generic sort of planners that my mom got at Target or Office Depot. I used them some, but not all the time. For college, as a way to motivate myself to use my planner more, I bought a Lilly Pulitzer Large Agenda in Peelin' Out. Of course, my monogram was added to the cover. I still love that agenda and since it runs through December, I'm considering using it for first semester, however I am looking at other options, these are some of the best (and popular) ones I've found. Emily Ley Simplified Planner ~ If I was picking from all of these (not thinking about cost), the Simplified Planner would be my first choice. I'm a major to do list maker, and I love that each day has a to do list column next to the daily schedule column. It has a section for notes and daily motivation. It is designed for the working mom so there's even a spot to plan dinner. I would probably use that for something else. I really like the clean, simple interior. It makes it easier to focus on what you need to get done. The down side is the cost. $58 is a hefty price for a planner. Day Designer ~ The Day Designer is a close second to the Emily Ley (I just love the golden pineapples on the simplified planner). The two are very similar with sections for daily schedule, to dos and dinner. However, the day designer has daily inspirational messages and a place to write down daily gratitudes, or the good parts of each day, which I think is a sweet touch and a reminder to find the good in every day. Once again, this one comes with an expensive price tag, $59. Erin Condren Life Planner ~ The Erin Condren planners have a major cult following, but I have to say I'm not a fan. While they are completely customizable from the cover to the layout, neither layout is right for what I'm looking for. The horizontal layout would be my choice but the boxes aren't lined and don't provide much space. Like I said, I'm a to do list girl and that doesn't really work in this one. I will say the Life Planners are probably better suited for people with big kid jobs, not students. I could find something better suited for what I need for much cheaper. Kate Spade Agenda ~ I love both of the Kate Spade planners I put on here. The gold polka dot is classic, and the quote on the other is a nice little pick me up. This is probably my top contender, if I'm going to get a new one for the fall. The pages have the clean look I prefer. The binding is also covered so the coils won't get messed up like traditional planners. It's more expensive than some but far cheaper than the others I've mentioned at $36. It just might be a birthday present to myself. 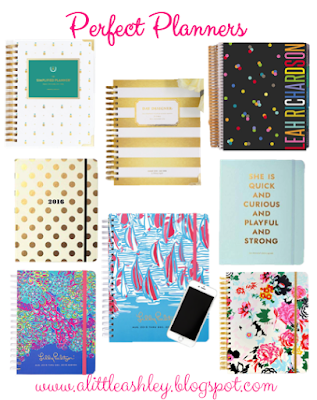 Lilly Pulitzer Agendas ~ Everybody and their cousin has a Lilly agenda and that's just fine. I had one for my first year of college, and it worked out really well. I got the large agenda in Peelin' Out, and while I loved it, there were times I wished it had a little more space for each day. My favorite pattern of all the Lilly Pulitzer agendas this year is Red Right Return (bottom middle) but it only comes in the jumbo size, which is a little bigger than a regular piece of paper. Even though I want more space, I think in the scheme of how I organize my backpack and things I need something smaller like the large agenda in Lilly's Lagoon. These agendas are so much fun and each month has a different print that goes with it. In my experience they also hold together nicely. It's understandable why they're such a favorite. ban.do agenda ~ A new planner I hadn't heard of before is from a cute little online boutique called ban.do. This agenda has a similar style to the Lilly Pulitzer ones and is equally fun and colorful (maybe even more so!). The pages are bright and whimsical, they even include suggestions for unique weekend activities below the boxes for the days. One downside for me though is that boxes for the days aren't lined, I guess that's just something I'm used to that I like and helps me stay organized. But if that's not an important feature to you, then go for it! The ban.do agenda is also reasonably priced at $28 (same as the Lilly large) which is always appreciated! Of course, there are a million other types of agendas and planners out there, and definitely some that come at a much better price. However, I like to spend a little bit more money on mine because I know how much I use it and how important it is that my planner holds up for the whole year. What are your favorite planners? Or do you not use one at all? Let me know!